Anyone who knows me will realize it’s a great achievement to have kept myself out of these pictures so far. Sadly it couldn’t last. This is me, taken by me, on top of New York’s Rockefeller Center (the Top of the Rock). 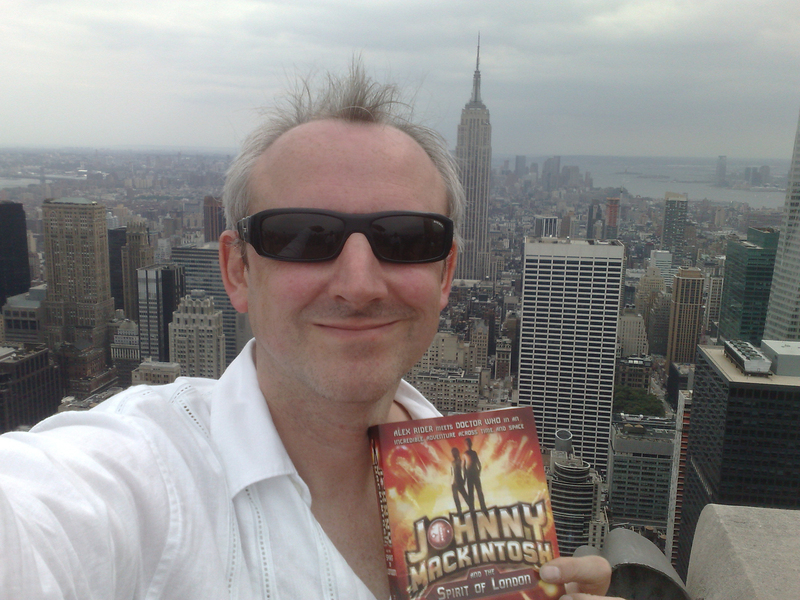 For reason’s that will become clear if you read Johnny Mackintosh: Star Blaze, I’ve spent a fair amount of time writing the book from 70 floors up on the Rockefeller Center’s observation deck. Behind, I expect you’ll recognize the structure behind me. I’m holding up the cover of Johnny Mackintosh and the Spirit of London to compare London’s Gherkin with New York’s Empire State Building. When in New York I always used to go to the top of the twin towers, often the Windows on the World bar in the North Tower (because you’d get the magnificent views to yourself and whoever you invited) but sometimes the South Tower because that way you’d get out on the roof. There’s something magical about being outside so high up. Even though I share Clara’s terror of heights, I never felt frightened there and the Rockefeller’s the same. Plus it has magnificent all-round views, including out over Central Park, though sadly yesterday’s Chrysler Building is largely blocked off. Another of my favourite New York roofs is the top of the Metropolitan Museum, watching the sunset over the city. 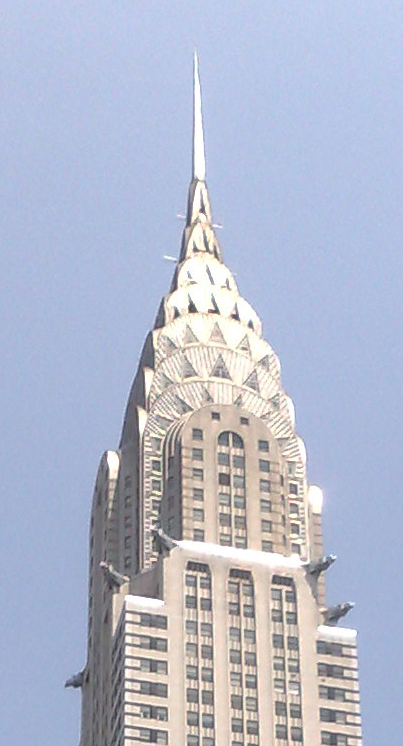 My favourite building in London is obviously the Gherkin; in New York it’s the gorgeous Chrysler Building. I took these pictures on my phone when last there in summer 2009. 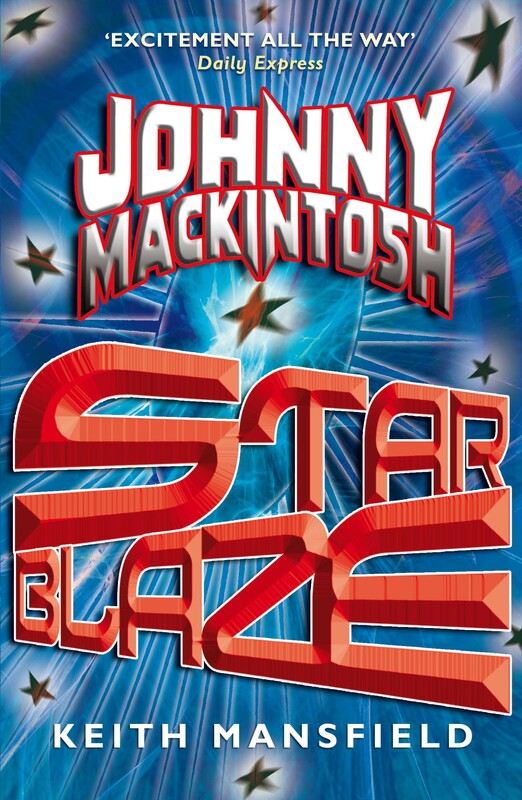 Some action in Johnny Mackintosh: Star Blaze takes place inside the building but, try as I might, I was only able to spend time in the lobby. To be sure I gave a reasonable description of the upper floors, it was fascinating to read about the building and its construction which briefly led this architectural wonder to become the world’s tallest (overtaking the Eiffel Tower), before its ugly nearby sister took over. The spire on top of the building was constructed in secret inside the main body, and only revealed and added on once a nearby building, also attempting to become the world’s biggest, was completed. 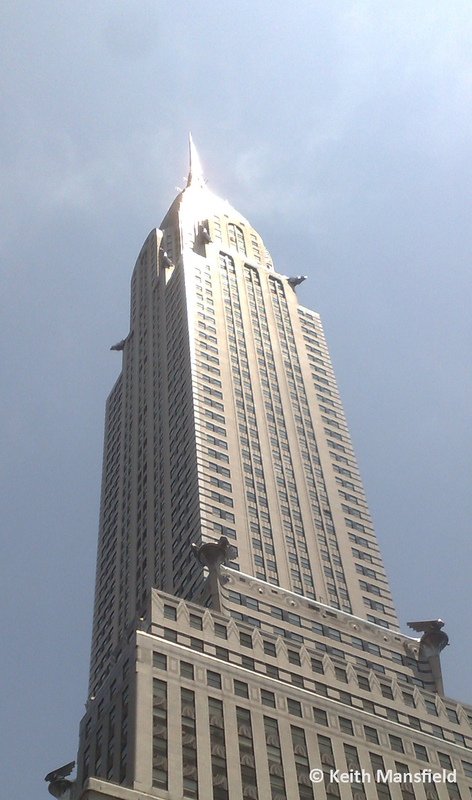 The art deco Chrysler building has beautiful gargoyles and its radiator grill top section. Nowadays, builders rarely leave room for either design or craftsmanship – I can’t fathom how some of London’s skyscrapers are allowed to be put up when their simply steel and glass cuboids. If something’s to dominate a city, it’s got to be worth looking at. As I sit at my desk writing this, I have the lights of the Gherkin in front to the left and those of the newer Bishopsgate tower on the right. Sadly, some very dull buildings are going up in between, but at least they won’t obscure the view.